Energy enters the biosphere principally as sunlight and is transformed into energy-rich organic substrates by photosynthesis and chemosynthe-sis. This organic matter, consumed either living or dead, fuels the metabolism of heterotrophs and in the process is returned to its inorganic state as respired carbon dioxide (CO2). Various chemical compounds of life must be acquired by plants in order for synthesis of new organic matter to take place, and by animals and microbes to sustain their growth and metabolism. Although energy exhibits a one-way flow from synthesis to dissipation via ecosystem metabolism, the chemical constituents of living organisms are continuously reutilized as they cycle between the biota and the environment. These chemical constituents are referred to as nutrients because they are necessary to sustain life, and the supply of nutrients often determines the biological productivity of an ecosystem. Heterotrophs obtain most of their nutrients from their food and by ingesting or absorbing water. Usually they are limited by energy in the form of organic carbon (C), rather than nutrients, although heterotrophic bacteria and fungi can be nutrient limited. Autotrophs are often limited by the availability of nutrients. Elements that are most heavily utilized are referred to as macronutrients, and include nitrogen (N), phosphorus (P), potassium, calcium, sulfur, and magnesium. Other elements including iron, manganese, copper, silica, molybdenum, chloride, and zinc are required in smaller quantities and are referred to as trace elements or micro-nutrients. The demand for certain nutrients, especially N and P, is much greater than their availability in aquatic systems; as a consequence the supply of N and P often limits biological activity. Human activities have profoundly altered N and P dynamics by increasing the available supply in surface waters, resulting in eutro-phication of lakes, rivers, and coastal zones worldwide (Carpenter et al. 1997). transport distances and rapid cycling relative to elements whose supply is less critical. 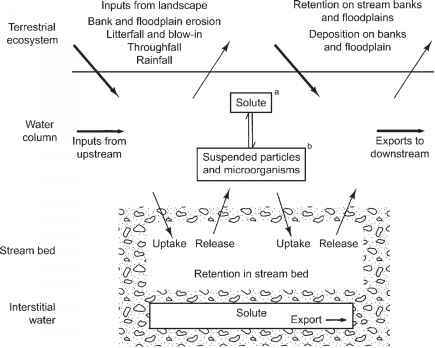 Nutrient dynamics in streams are further complicated by various abiotic uptake and release mechanisms that partially regulate nutrient concentrations and, particularly in the case of N, by several transformations among inorganic states that yield energy to specialized bacteria. In this chapter we examine the often complex relationships between availability of inorganic nutrients and their utilization by the biological community. 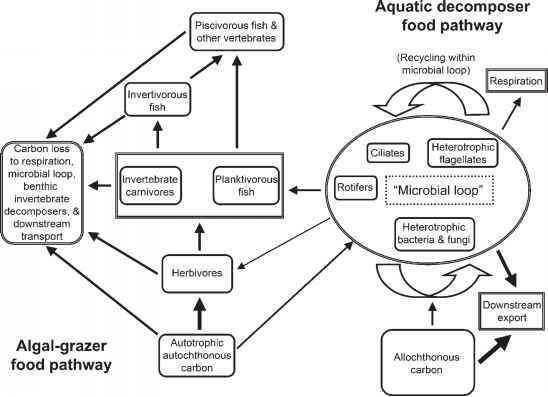 There are, broadly speaking, two perspectives: how nutrient supply affects biological productivity, and how processes within the stream ecosystem influence the quantity of nutrients that are transported downstream. As previously discussed in Chapters 6 and 7, nutrient supply can limit rates of photosynthesis and organic matter breakdown and thus the rate at which basal resources for stream food webs are produced. Rivers transport substantial quantities of dissolved materials to receiving lakes and oceans (Chapter 3), and so instream transformation, storage, and removal processes may be significant in large-scale element budgets. Especially in the case of N and P, which can cause algal blooms in coastal and lentic waters, nutrient dynamics within river systems may influence the extent of eutrophication of receiving water bodies.